Shown here at right are some of the concepts that might be covered. I say "might" because there is too much to cover in a single lecture/presentation, so parts are left out, parts are glossed over, and there are some things that are mentioned that aren't on the diagram. The boxes in green are the concepts that are pretty easy to explain without any additional ideas. For example, consider $5^2-1$ and $7^2-1.$ The number 24 is prominent, so try $9^2-1.$ Hmm. What about $11^2-1?$ Ah, there's 24 again. And in $13^2-1,$ but not $15^2-1.$ Again in $17^2-1$ and $19^2-1,$ but not $21^2-1.$ We form the idea that for any prime $p,$ $p^2-1$ is divisible by 24. What about expressing a prime as a square plus 1. Can you do that? Can you do it again? 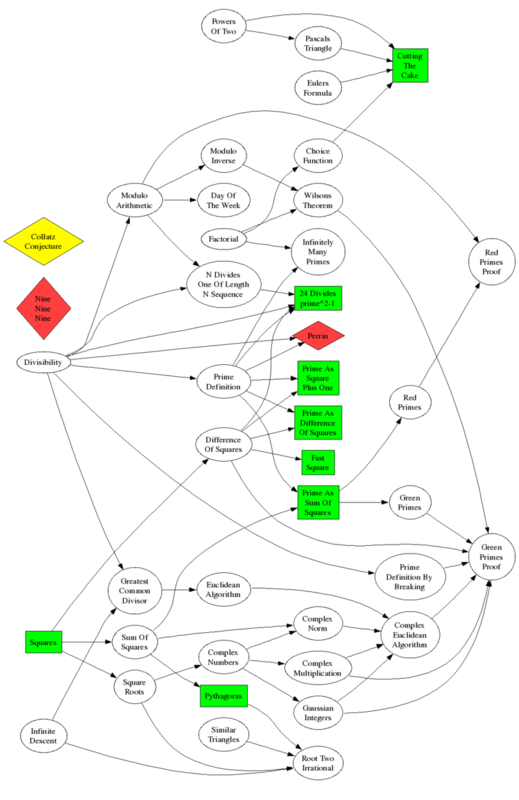 The arrows on the diagram indicate dependencies. We need to know what a prime is before talking about a prime being the sum of two squares, but we need to talk about divisibility to define primes. Proof is easy - consider everything module 4. Proof is hard - look at the dependencies. How many pieces does this cut the circle into?